It’s slow going with a team of two, but we are making solid progress. We’ve recently tested cooperative play against the AI… and got creamed. The AI is a mad man in need of a leash. It was great fun in any case. I’ve made the AI attempt to shoot down incoming mortars and missiles, and on the Under Siege map, where Team 1 must defend against an onslaught from Team 2 with only machine guns and snipers, the spray and noise coming out of the fort is something to behold! 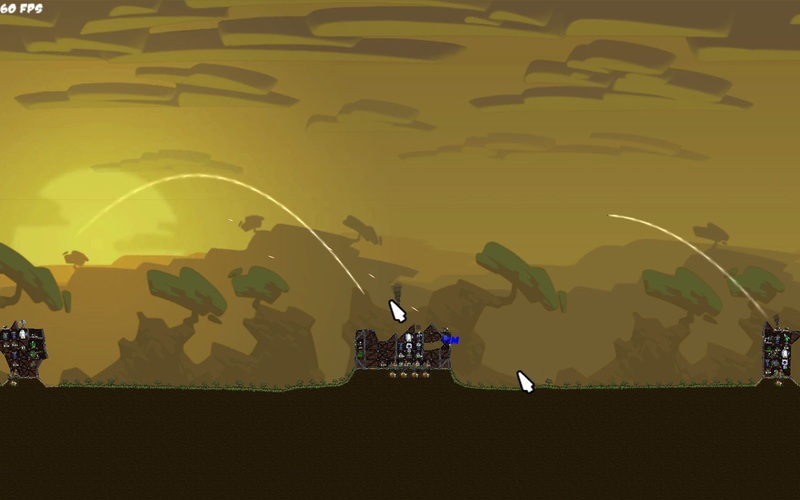 The AI is able to aim and shoot multiple weapons at once, unlike human players. It can currently rebuild individual struts that have been destroyed, but if a joint goes then it can’t rebuild them – which will soon be rectified. In the Under Siege map Team 2 has forts on either side of Team 1, so it’s easy to split responsibilities – see screenshot below. In the Broadsides map with only one fort between us, we decided to try having one player on weapons and the other on construction and repair. It worked really well until resources became constrained. The missile launcher weapon sits on the ground and fires up and then homes in on the target, so it’s possible to hide it behind your fort. This is quite unbalanced, as it’s difficult to destroy something hiding behind a fort. To solve that the snipers now act as spotters for the missile launcher; painting the target with a laser. This means you have to have a sniper exposed to the enemy, and you can only fire the missile at something a sniper can see. The enemy also gets a warning; a red laser sweeping the fort. The laser must lock onto the target while the missile is flying. Taking out the sniper in the meanwhile may lead to unpredictable results! I’ve just added an upgrade system for weapons to increase the depth of the game. The first weapon that can be upgraded is the machine gun, which upgrades to a minigun. While the machine gun is for defense and harassment, the minigun is an offensive weapon. A longer, faster and narrowly focused stream of projectiles spews from this monster, chewing up almost anything in its path. There are neat ways of defending against it though, and its additional cost and reload time don’t make it a silver bullet.